In 1986, Mr. Petit funded a professorial chair for "Engineering in Medicine" at Georgia Tech. In 1995, he endowed the Petit Institute for Bioengineering and Biosciences at Georgia Tech. In 2001, he helped fund the Biotechnology building at Georgia Tech which has his name. In 2004, he assisted with the funding of the Science Center building at Georgia State University which also has his name. In 2007, he was inducted into the Georgia State Business School Hall of Fame. In 2010, he made a $1.5 million commitment toward the Georgia State University Football Practice Complex, representing the largest gift ever made to GSU athletics. 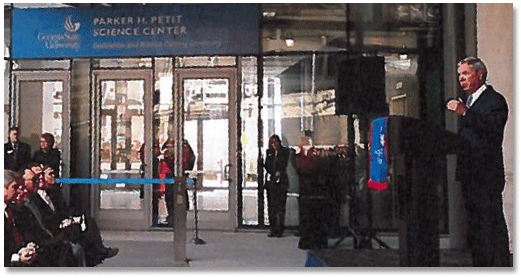 In 2011, Georgia State University dedicated its state-of-the-art 350,000 square-foot Parker H. Petit Science Center.